Analog Interface for PC Ports. Control Interface to PC Ports. Analog devices like transistors and diodes lead to opamps and analog computing. This takes more parts but with fast devices, it is real time. Then came Logic and Digital Circuits, here also big systems will take too many parts. A very Old hp Logic Analyzer instrument, could be HP1607A, had more than five large PCBs, Toggle Switches and numerous 74F00 TTL Chips. Design Gopher - Product Design, EDA, ASIC Design. Hyper Embedded - Microcontroller, SOC, FPGA, ASIC. 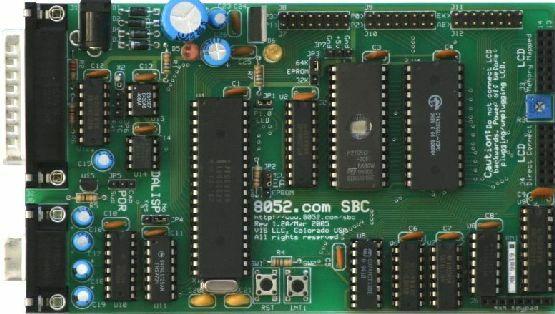 "The 8052.com SBC is a single-board computer designed to be both useful and instructive in illustrating certain concepts commonly encountered in 8052-based development. Designed to compliment The 8051/8052 Microcontroller Book that was authored by Craig Steiner, the webmaster of 8052.com. " Then came the solution the Microprocessor. Here the entire system goes into the firmware and a Hardware. Tool Set in the Microprocessor made up of Logic and Math, sequentially used to perform the same operation that would require innumerable Gates in a plain hardware digital circuit. But as it performs the operations one after another, it takes time, hence the speed is defined by the CPU Clock Speed and Bus width. Now soft cores of some popular chips and new structures are available as IP. These can be integrated in your FPGA or ASIC design. The speed and capabilities of a Microcontroller system depends on how Intelligent the hardware is. Less code needs to be written, when more standard software routines are implemented as hardware blocks. One example is the Numeric processor 387 integrating with uC 386 to form 486 with other enhnacements. Another example is the serial port or UART in 8051, this had to be coded in the 8748. An Embedded Microcontroller or DSP system is made of Chips, Circuits and Firmware. The digital voltage levels, speed, bus width, fan out, power consumption are some factors that a designer has to keep in mind. As portable and wireless gadgets are becoming more popular, RF, Ethernet and Energy Efficient Design aspects should be studied. Power electronics and Analog Circuits knowledge is used around the system, all this is integrated to make an instrument, equipment or gadget. 80C51 ports can sink more current but source very less, hence use a 10k pull up at all the ports or outputs. Firmware must be developed in increments, tested in increments, backed up in increments, must be modular (include) reuse. Tristate output, High Impedance and Floating all mean the same when it comes to IC Inputs-Outputs. It means the pin is insulated from rest of circuit in the IC. That means it will not influence the node or bus it is connected to. A DMM terminals are floating means that the hand held plastic DMM has no electrical conductive link to earth or ground. You can use hyper terminal to upload code to single board computers 80C51 like in BINARY or ASCII. ASICs are for large volume production, or for products which have a long product life cycle. Low volume production use FPGA or CPLD, or even flash based microcontrollers, so that all your inventory can be reused and recycled. Cell phones or a LAN card ASIC is ideal as volumes are good in cell phones and for LAN cards the technology is matured. For either FPGA or ASIC's you get IP Modules or Code Libraries for many functions and applications. In the future chips may be both analog and digital programmable with flash. Unused CMOS inputs should have a pull up or pull down resistor, it should not float, or it oscillates. Have a decoupling capacitor 104 that is 0.1uF or 100nF across the supply of every IC very near the IC supply pins. A watchdog timer should be used in every microcomputer circuit like 8051 so that the system resets on hanging. The reset on a microcomputer should be applied till the supply to it is stabilized, this will enable a clean start. Pull up or pull down resistors in TTL can be 10K and in CMOS 100K and in battery operated systems 1M. CMOS gates and Opamps have a output drive capability of ~ 10-20mA, so when you drive a load say an LED use a series resistor to limit the current to 5mA to 10mA. Try to use same family ICs in a circuit, like only LS or only HCT, if you mix up then you have to do a design review. In a industrial environment many motors, DC drives and AC drives will be running, this will produce EMI, RFI, kickback spikes which cause microcontroller based equipment to hang. Use a watchdog timer for uC. More EMI immunity by using opto couplers for all input and outputs, 4-20mA current signals for input and output and an isolated wide range SMPS. Reads51 Learn 8051 with a IDE with C.
Kainka Mikrocontroller - Projects, Books. PjRc.com - 8051 Microcontroller Tools.